Rosewood Mayakoba is a luxury resort on Mexico’s Yucatán peninsula. It’s located just north of Playa del Carmen in the upscale Mayakoba development. There are 128 suites in total, all with outdoor showers and private plunge pools, either at the beach or overlooking a winding lagoon. They’re designed for privacy, ultimate relaxation and personal indulgence in an eco-conscious setting. The development feels like a contemporary and friendly 21st century version of the ancient Maya palaces complete with a 24 hour butler service. After the always slightly chaotic arrival at Cancún airport, you’re immediately transported into another world when you cross the main gate to the Mayakoba complex. After driving on a small, winding path flanked with dense jungle on both sides you reach a second security gate for the Rosewood resort, signaling that the place you’re arriving it is quite special. And it is. Arrive by night and you’re greeted by fires and lanterns that lit up the resort entrance. Before you know it you’ve been checked in and you and your luggage have been teleported to your suite. 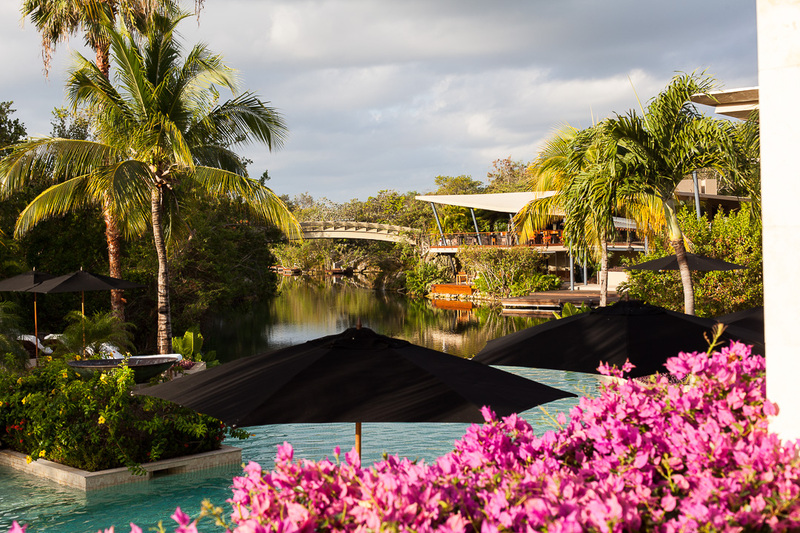 A spectacular circular stone stairway with a water feature connects down to the dock of the main compound while the upper level connects to the restaurants and small plaza with a shop and the tequila library that also functions as a pop-up for treats such as doughnuts and ice cream. Arrive by day and you’ll be taken to your suite by boat, after sunset you’ll have to do with being driven by a golf cart but can choose to take the boat ride later just to experience it. We’ll get back to the design, food and amenities, but what immediately stood out at the Rosewood Mayakoba was how genuinely friendly and caring the staff was. It’s one thing to offer a butler service that can take care of your smallest wishes, but it’s another to get a warm smile and sincere attention from every single staff member. Which is good, since it seems to be legions of them, making sure that the resort looks impeccable and everything just runs smoothly. From your suite you wouldn’t know though, when you want to be left alone you will be, without having to tell anyone. Mayakoba is a large scale development by Gruppo OHL to bring hoteliers to the Riviera Maya on a common foundation of eco-consciousness and high-end luxury. The El Camaleón PGA golf course was the first finished project in 2005 after planning started in the mid-90’s. Later Banyan Tree, Andaz and Fairmont has completed hotels, all connected through a natural canal system. Rosewood Mayakoba was completed in 2008 and a number of vacation homes associated with the various hotels is the latest addition. Dallas-based Three Architecture is responsible for the overall design with Jose Manuel Martinez Marquez for an update in 2012 that includes 18 adjoining suites and rework to most of the common functions. From the outside, the main campus buildings are almost Lautner-inspired, with wide, angular roofs covering both indoor and outdoor spaces. Just like Lautners structures, they look perfectly fit for a Bond villain’s tropic hide away. There’s beautiful stone everywhere which makes the structures feel solid and grounded in the fluid jungle. Hard, geometric angles are broken up by softer round shapes and organic features. 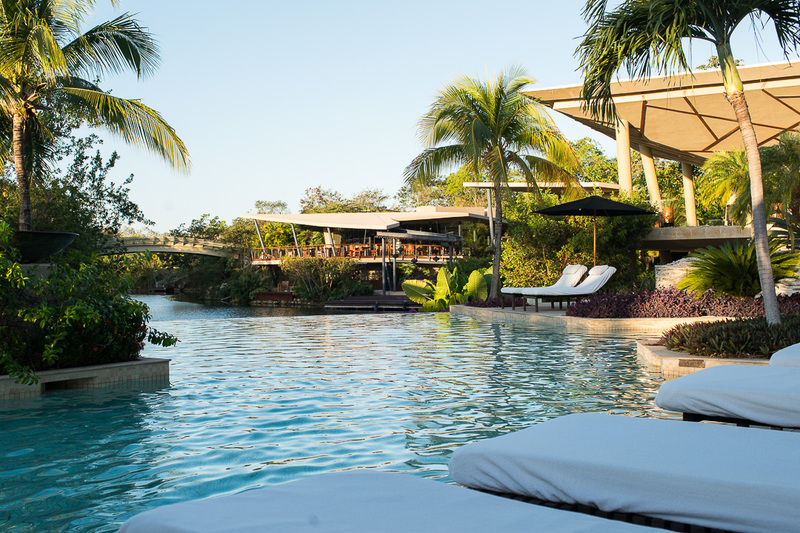 The most obvious Mayan influences are by the main pool area, where the multi-level pools again features lots of local limestone and a number of nooks and crannies with a spectacular overview over the lagoon and the front-desk building. There are both cabanas and beach beds available (no additional charge) with a nice over-supply that takes away any stress of getting a good bed. You’ll not only be pampered in towels and pillows but also get an ice-bucket with water bottles and staff only a gaze away that can bring drinks or food from the restaurants. A second pool is located by the beach that features the same service. A spa with a fitness center is situated in the resort, well-equipped with Technogym equipment and free weights. It’s free to use, as is the spa pool, but the treatments are priced according to the overall price level (around $400 for a 60 minute massage). During our stay crowding was simply not an issue and the spa pool was entirely empty. There are three restaurants at the resort, Casa del Lago, Agave Azul and Punta Bonita. All stand out on “best place to eat”-lists for Playa del Carmen, with the Casa del Lago being the main restaurant that serves breakfast and dinner from a Mexican and Italian perspective. The Casa del Lago bar also serves lunch – and killer Margaritas – close to the pool. Agave Azul is a combined Tequila bar and sushi restaurant, with some other Asian cuisine represented as well. Punta Bonita is located by the beach and has a bigger focus on lighter, refined Mexican dishes. 24 hour room service with many of the favourites from the different menus is also available. It’s easy to spend an entire vacation on the resort, even if you want to do other things than hang by the beach. There are on-site biologists which provide tours, yoga classes, food classes with the head chef and more. The suites are spread out in separate or adjoining bungalows, which are more like villas for the bigger ones, connected through a winding system of pathways flanked by colorful bushes and flowers. It’s possible to borrow bicycles to get around more easily, or you can just hail one of the golf carts that drives around. Each suite has its own private path and entrance. Navigating the area can be a little tricky with all the winding paths. Take a wrong turn and you might end up somewhere else than you planned to, but the distances are so short that you just enjoy finding the hidden spots and culinary gardens dotted around the campus. Although we had booked the lowest priced rooms, the $550-695/night plus tax and resort fee Lagoon Studio Suite, we were upgraded two steps to a Deluxe Overwater Lagoon Suite costing a cool $850-990 plus taxes and resort fee per night (resulting in around $1327/night). At a glance the bungalow looks quite square and geometric, but the exterior shape is broken up by a screen made from branches on the outside of the bridge that leads to the door and the front porch. It almost looks like a bird’s nest, which was very appropriate since a pretty little bird had taken to building a nest on the outer corner. 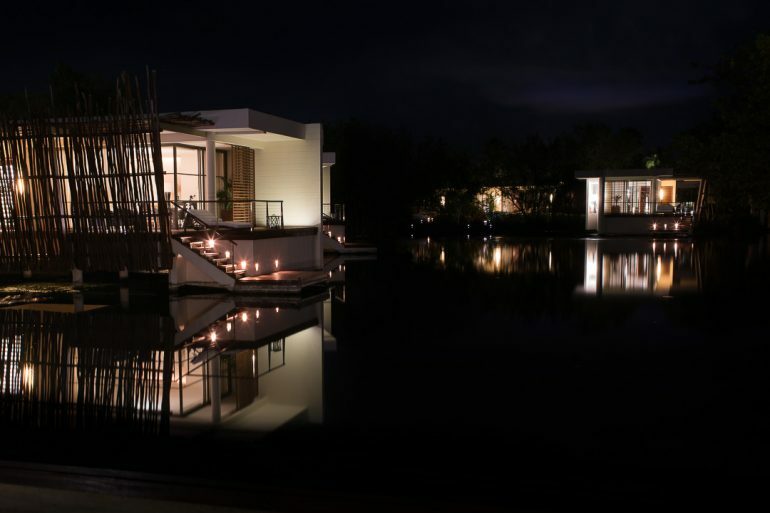 As the name suggests, this suite is free-standing and is suspended over the water of the lagoon. The overwater bungalows are composed of many angles with multiple negative volumes that open up the inside to the outside. A big void is in connection to the living room, which meant that it was basically open on three sides, and a second extended from the outside shower garden towards the bedroom, completing the symmetric layout of this room. There are multiple more small windows scattered around, but even with these every room felt private. The most private space is the outdoor shower garden. A full glass wall opens up from the bathroom with a door through the shower. With the interior doors open this space can be seen through the entire suite, right from the plunge pool overlooking the lagoon. Although an enclosed space (except from above, obviously) it’s perfectly sized to be open and spacious without feeling exposed when using it. These suites are made for couples though, there are his and hers sinks but the toilet booth is quite exposed, as is the shower, which means that for this kind of privacy additional doors have to be closed. Facing the lagoon is a porch with a sun bed, a small table with chairs and a plunge pool. 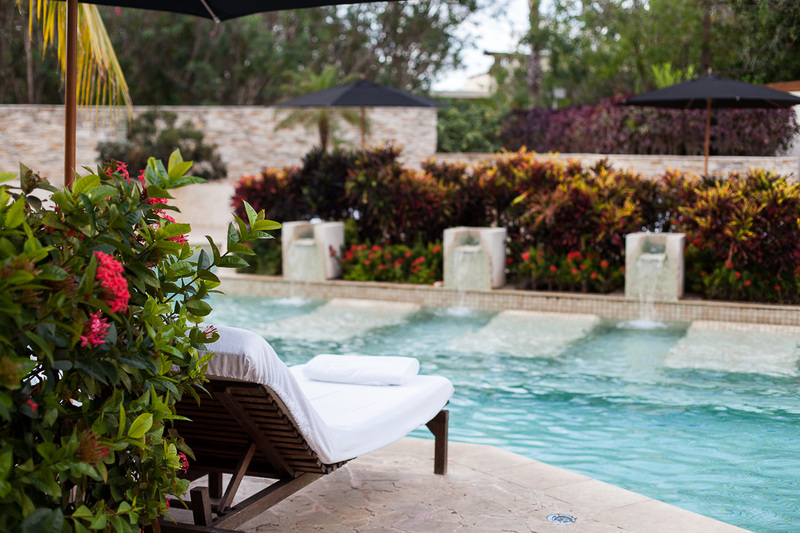 It’s kept heated and always available for a quick cool down or an evening dip. Space is simply not a problem, as this suite strictly designed for two totals 91 m2 (977 sq.ft.) interior space with a very generous ceiling height throughout. Food at Casa del Lago (the main restaurant) is mostly International Mexican in style, with both Mexican versions of international classics as well as refined Mexican food. 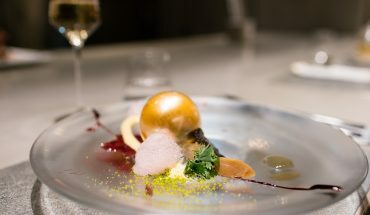 Even though the dishes comes from different foundations everything feels consistent and would not be out of place in Iron Chef or a Michelin star restaurant. The buffet breakfast ($34 plus taxes) includes a range of plated dishes that can be ordered. 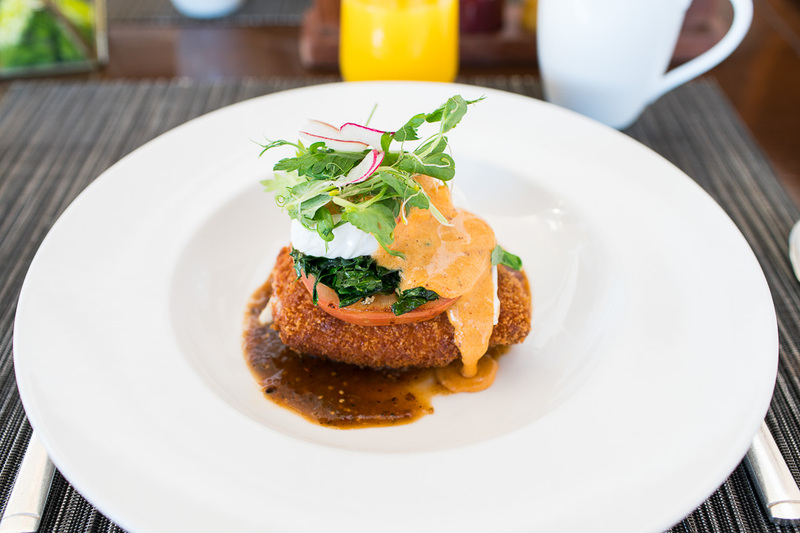 A particular highlight was the Mexican Eggs Benedict, a poached egg on top of breaded and fried Queso served with Chipotle Hollandaise. The buffet itself was world class with pastries that stand out as by far the best in the entire Playa del Carmen area. Coffee was deeply satisfying, a deep and soft roast with chocolaty notes. Also easily the best in the area and way better than the watery, bland coffee served most places. Throughout the day drinks are available from the multiple bars. 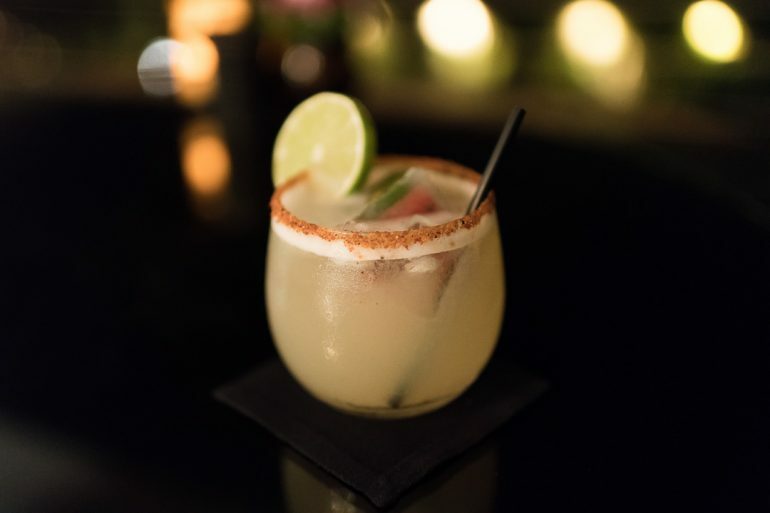 The drink program includes multiple versions of the Margarita and it would be a good idea to sample them all, had it not been for the fact that they are made properly with real punch. Consistent was how the herb-like tones came through and how the familiar tequila notes came through but was still balanced. I’m not the biggest fan of tequila as a spirit but these showed me a way for how to use what’s there to great effect. We observed a large range of guests, from extended families with young kids to young couples to groups of middle-aged vacationers. The exception was that we didn’t see spring breakers, guess they are better served at other places. One common denominator is that everyone seemed quite well off, which is not that surprising with the overall price level. Throughout Rosewood Mayakoba there’s a sense of serenity, only electric vehicles are used and the staff is meticulous, calm and always smiling. I would smile as well if I spent my days here. One of the more impressive aspects was how clean and polished everything is. The resort is literally situated in the jungle but there are no mosquitos or critters and every surface is clean from vegetable debris. It’s hard to describe exactly how good the service was, just listing the service level and features is simply not enough to do it justice. Say something to one staff member and the rest will know immediately and adjust accordingly. For example, I’m allergic to avocado (which is a bit of an issue in Mexico) but after letting our waiter know this during the first breakfast the lunch personnel, which we hadn’t met at that point, were also aware. They were as coordinated as a ballet with the attention to detail of a watchmaker. 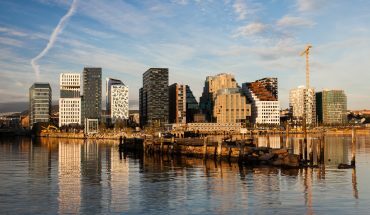 Much is included in the mandatory resort fee, like water in your room, by the beach or the pool areas or things like the doughnuts in a pop-up shop and smoothie shots on the beach, but as soon as you actually order something the bill quickly becomes quite significant. A breakfast for two is $100 including taxes and an optional small tip, a taco lunch with two Margaritas, $100. It soon adds up. But this is not a place to sweat every spent dollar. Budget accordingly and it will be one of those experiences that you simply can’t forget. 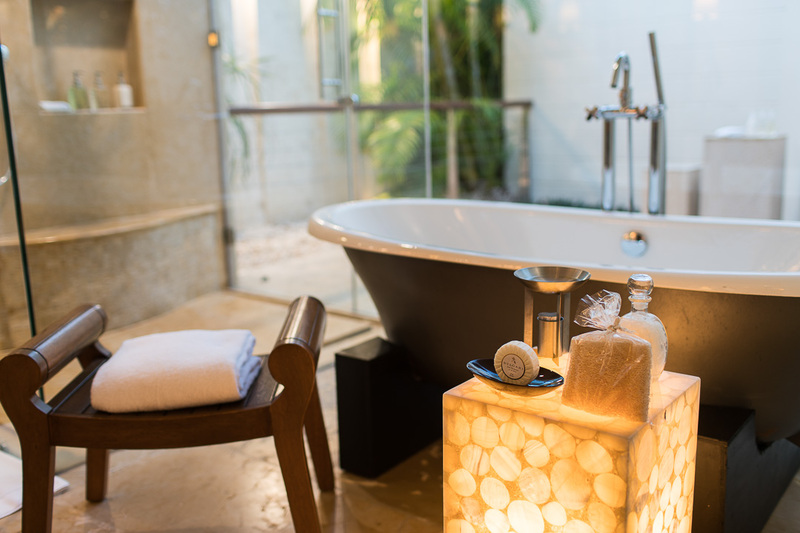 Rosewood Mayakoba is an oasis from everyday stress and problems located in a jungle paradise. It takes everything that makes Playa del Carmen and the Mexican Caribbean coast great and elevates it beyond next level. You don’t have to worry about a single thing as it will simply be taken care for you. It’s simply a bucket list resort for anyone who wants to experience the greatest destination hotels in the world.